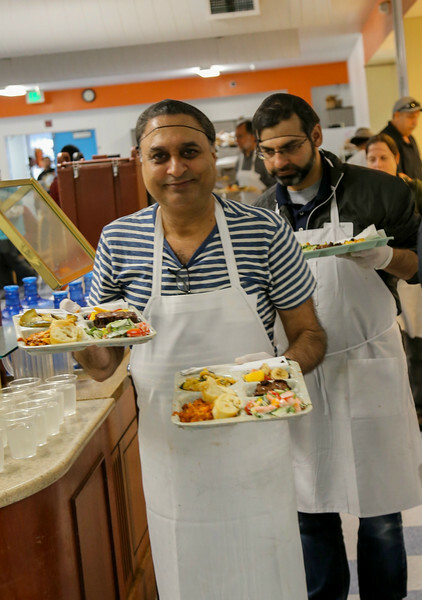 SARATOGA, California — On Sunday, October 22, 2017, more than sixty Jews, Christians, and Muslims united to serve the homeless and hungry of San Jose. Orientation was led by Rev. Arvin Engelson of Saratoga Federated Church​, Sr. Iris Bendahan of Congregation Beth David, and Br. Hasnat Ashiq of West Valley Muslim Association. Volunteers enjoyed getting acquainted in small buddy groups before working together to prepare 300 kosher and halal meals for our friends who live outside. Before volunteers departed for meal service, Br. Hasnat Ashiq led his community in afternoon prayers as Jewish and Christian volunteers observed and followed along with a handout showing an English translation of the Arabic liturgy. Then Sr. Iris Bendahan recited a beautiful blessing upon volunteers who serve the community, based on a prayer from Siddur Sim Shalom. Volunteers convoyed together to Cityteam Men’s Recovery Center in downtown San Jose. Rev. Engelson gave thanks in prayer before guests dined. Instead of lining up for dinner as usual, guests took a seat and volunteers waited on tables to honor them. Br. Hasnat offered a closing prayer/dua thanking God for our collaboration together and for the new friendships begun. Many thanks to Br. Neal Locke, Sr. Iris Bendahan, and Br. Hasnat Ashiq for making all preparations. Thanks also to Rev. Arvin Engelson, Sr. Iris Bendahan, and Br. Hasnat Ashiq for their excellent leadership. Special thanks to Br. Chris Cassell and Br. Michael Miller for photographing the event. Most of all, thanks be to God, الحَمْد لله‎ , ברוך השם for the privilege and honor of serving together. Photos courtesy of Chris Cassell and Michael Miller.